The premiere edition of World of Concrete India is dedicated for showcasing advanced technology, latest equipment and cost effective solutions for modernizing concrete industry in India. The concurrent conference ICI-IWC 2013, organized by Indian Concrete Institute will provide an exclusive oppor‎tunity to deliberate on challenges posed by concrete industry in India. The event that will offer vast networking opportunities to meet your clients face-to face, develop leads and take your business to another level. WOC Show FloorWorld of Concrete India will make its premiere in India from October 24-26, 2013 at the HITEX Exhibitions Center in Hyderabad, India and is an extension of the world famous World of Concrete exhibition, owned and produced by Hanley Wood Exhibitions in Dallas, Texas, and held in Las Vegas annually. The Indian edition is being jointly organized by Hanley Wood, USA and Inter Ads Exhibitions, India, supported by the Indian Concrete Institute (ICI). The events aim to address new developments in concrete and construction, especially in the infrastructural sphere. 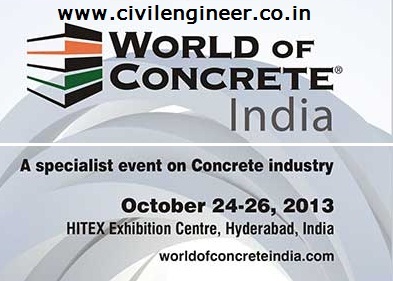 The inaugural edition, World of Concrete India 2013, will welcome suppliers from the commercial concrete and construction industry in India. The exhibition will serve as an excellent platform for industry suppliers to showcase innovative products, state-of the-art technologies, latest tools and equipment used in the industry. India is modernizing its infrastructure at a fast pace and concrete is an essential requirement of infrastructural development; thus it is imperative to have such an event which addresses the needs of this fast expanding industry. The top new products, equipment manufacturers, construction equipment machinery, and suppliers will be seen at World of Concrete India 2013!